Comments: The Washington Society of Baltimore was originally formed in 1840 as an organization devoted to total abstinence from alcohol and soon changed its name to the Washington Temperance Society. The organization commissioned the engraver Robert Lovett, Sr. of New York City to design a pair of medals for them. These items were minted and distributed during the 1840's. Both medals shared the same obverse, a bust right portrait of Washington with the motto, WASHINGTON TEMPERANCE SOCIETY and below the bust the name of the engraver "LOVETT N Y." One medal, Baker 328, had a reverse with a seven line pledge stating, WE AGREE TO ABSTAIN FROM ALL INTOXICATING LIQUORS EXCEPT FOR MEDICAL PURPOSES AND RELIGIOUS ORDINANCES. and then around the edge, TEMPERANCE DECLARATION / TEMPERANCE IS THE FOUNTAIN OF HEALTH. 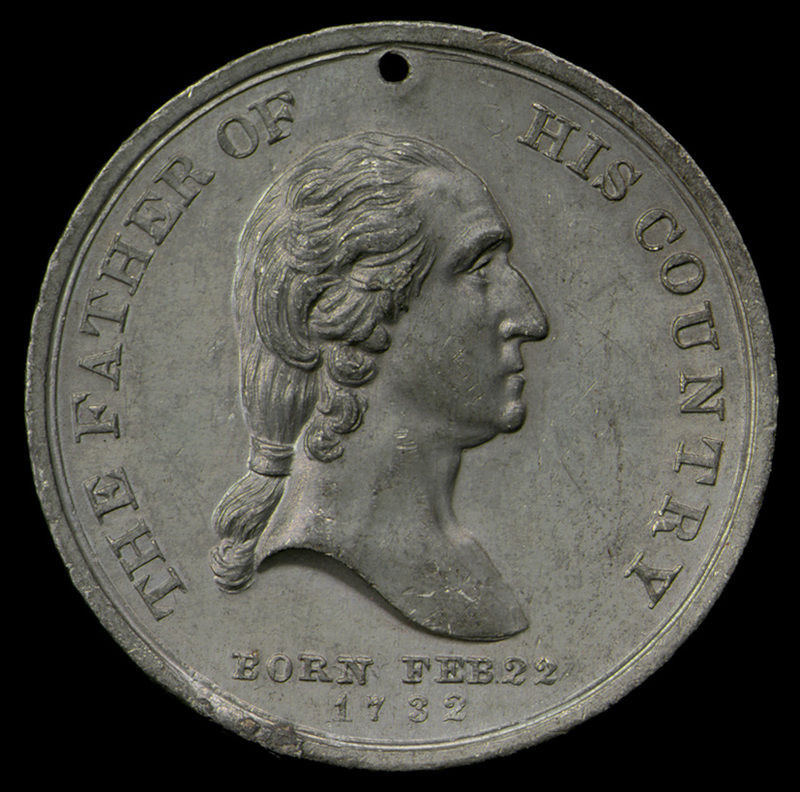 This medal was issued in copper, brass and bronze varieties. 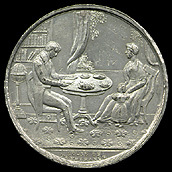 The companion medal had a reverse displaying an interior home scene showing a family which does not use alcohol. The father is reading at a table while the wife attend to their little daughter. In exergue is added: HOUSE OF / TEMPERANCE. An example of this medal is displayed here. Several other Washington temperance medals were struck at this time. 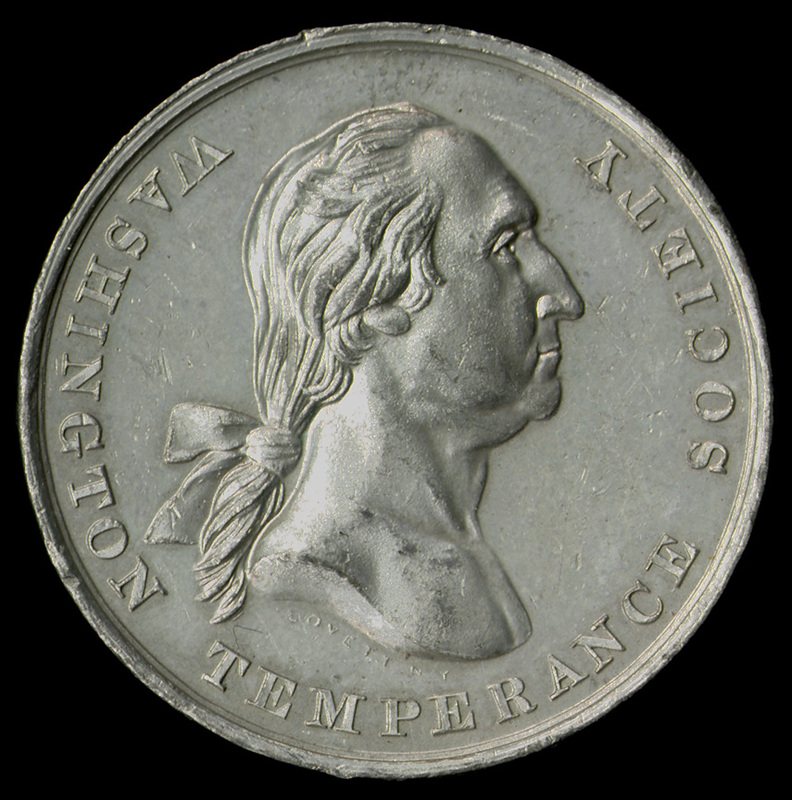 The Washington Temperance Benevolent Society struck three different medals, all with a bust right of Washington on the obverse. This obverse was combined with three different reverses as follows; one reverse had the motto UNITED WE STAND, DIVIDED WE FALL (Baker 330), another depicted a water fountain (Baker 331) and a third contained the motto WE SERVE THE TYRANT ALCOHOL NO LONGER (Baker 333). A related medal from the 1840's, but not attributable to any specific group, has a bust left of Washington on the obverse and on the reverse the legend, TO THE CAUSE OF TEMPERANCE TEN DOLLARS TO KING ALCOHOL NOT ONE CENT (Baker 334). Reference: Rulau and Fuld, pp. 147-148. Comments: The Washington Monument was first promoted by the Washington National Monument Society, formed in 1838. Construction of the structure began in 1848 and continued through 1884 with a dedication ceremony in 1885. In 1848 a medal was issued to commemorate the commencement of the construction, for which the cornerstone had been laid on the fourth of July. Unfortunately the designer of the medal is unknown. 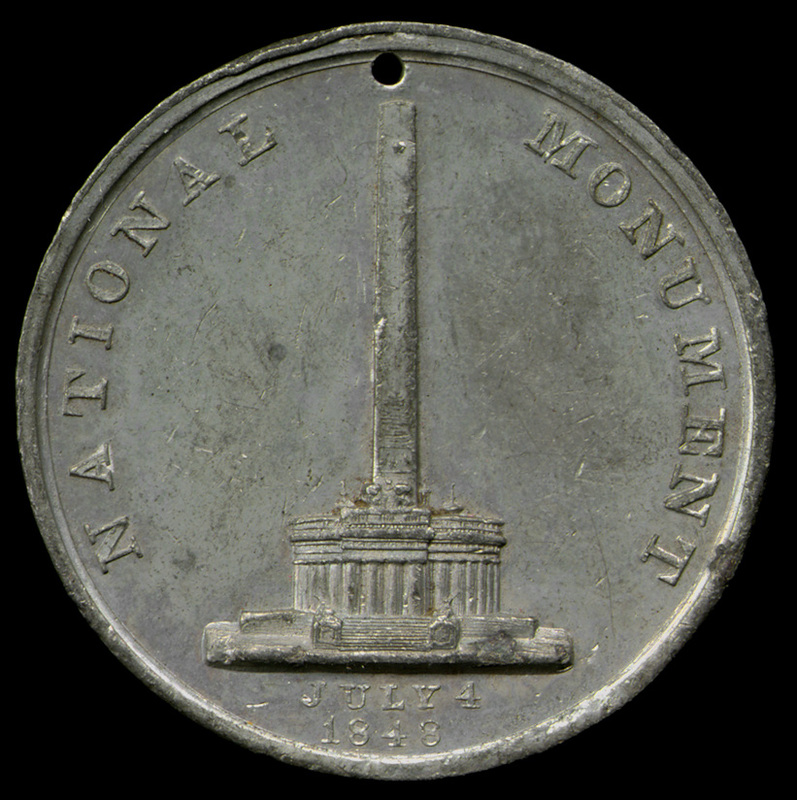 The obverse shows a bust right portrait of Washington while the reverse shows the a conceptual design of what the Washington Monument would look like. Rulau and Fuld suspect the reverse shows the monument in an early stage of construction but I could find no evidence the monument ever looked like the image on the medal. The medal was made with a hole at the top so that it could be pinned onto clothing or suspended from a string or ribbon, suggesting it was produced for a public event associated with the initiation of construction. Fuld and Rulau call this medal "excessively rare." In 1875 as the monument was nearing completion another Washington medal was privately issued to commemorate the event. This medal, designed by one of the Lovett brothers, was issued as number three in Wood's series of medals. It is found in two quite similar varieties (Baker 321 and 322), each in various metals. The obverse shows a bust of Washington noting the centenary "1775 - 100 YEARS - 1875" The central inscription around the rim of this medal reads on the obverse: FIRST IN WAR AND IN PEACE / LAST IN SECURING (continuing on the reverse) A MONUMENT. Also on the reverse is an image of the unfinished monument and the following: CORNER STONE LAID 1848 . COMPLETED 1876 (?). In what is called the second reverse (Baker 322) the question mark precedes the date. Actual construction of the monument was not completed until 1884. Reference: Rulau and Fuld, p. 141.